I had four large bags full of young adult fiction, and I stood waiting for the volunteers to tally the total. Usually I attend the Newtown CT Book Sale on one of the opening days when the books are full price. I have waited in the early morning hours on a long line for first crack at the trade paperbacks. But, this was 1/2 price Monday, and I was getting TWICE the amount of books for classroom libraries. To be honest, I had never shopped on the 1/2 price day, assuming that there would not be any books left. After the weekend crowds had had there full, there were still hundreds of young adult (YA), “tween,” and upper elementary chapter books laid out on the tables. I could keep shopping! I had also assumed that any remaining books would piled chaotically from the book shoppers over the weekend. But I was right about the amount of help I would get from volunteers. One of the volunteers noticed the titles I had selected, and the logos on the bags I filled: Scholastic, Penguin Young Readers, Lakeshore Learning, Heinemann. I was returning home from the International Literacy Association Conference (#ILA2016) in Boston, MA, and I was already using the “swag” that had been handed out by the different education book publishers in the conference exhibition hall. 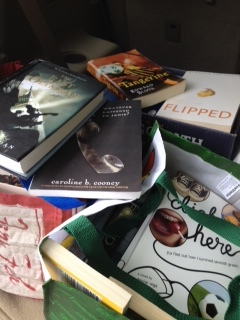 I was, quite literally filling these literacy tote bags with literacy books. “You must be a teacher,” she noted, “I used to be a teacher.” So was her fellow volunteer. Of course, it is not surprising that several of the library book sale volunteers were former educators; they know the power of getting books-these piles of gently used books-into the hands of young readers. They tallied my piles, and we chatted about what students read, what book covers attract readers (dark and spooky, we agreed). Then, they loaded my purchases on a cart, and one former teacher helped load my car with the four bags plus two additional boxes of books. In total, I spent $103 dollars. Shopping on 1/2 price day yielded 184 book titles, some of which included student favorite titles by Sarah Dessen, Rick Riordan, Sarah Weeks, Gary Paulsen, and Andrew Clement. These books will be going into classrooms, grades 5-9, for independent reading. Thank you, again, CH Booth Library volunteers. 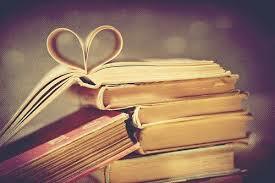 Your book sale will help to have a positive effect on student learning and school achievement! “What’s the last ‘best’ book you read on your own?” I would ask students when I taught middle and high school. When I asked them this question, the boys almost always answered “Hatchet“. “That’s the last book I read, too,” many would admit. The number of Hatchet fans was 100% among the vocational agriculture students I taught for seven years in a rural school in Northwest Connecticut. Their love of this novel resonated with their desire for independence, adventure, and the outdoors. Running away from home at the age of 14 and traveling with a carnival, Paulsen acquired a taste for adventure. A youthful summer of rigorous chores on a farm; jobs as an engineer, construction worker, ranch hand, truck driver, and sailor; and two rounds of the 1,180-mile Alaskan dog sled race, the Iditarod; have provided ample material from which he creates his powerful stories. 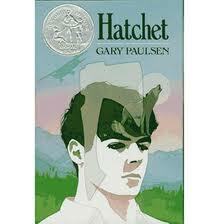 In Hatchet, Paulsen’s protagonist, Brian Robeson, is a thirteen-year-old boy from New York City. From the onset, Brian is ill-prepared to meet the hardships of the wilderness when the single engine plane he is riding in from New York to Canada crashes because the pilot had a heart attack. Thus begins a compelling survival story, and my students loved survival stories; many of them were experienced hunters or fishermen. The opening chapters of Hatchet also cover Brian’s personal background, his knowledge of his mother’s affair and his parent’s subsequent divorce, and the events leading up to the plane crash. Since the pilot had offered Brian a few minutes of flight lessons, he is able to control the descent of the plane until it crashes into a lake. He swims to safety with his only asset, a small hatchet he has taken from the crash. Brian’s wilderness education alternates between emotions of loneliness and his physical needs. He learns to respect the natural world through a series of unexpected encounters with a bear, a porcupine, and a wolf. A turtle’s eggs give him a food source until he learns how to fish. He learns how to build a fire and how to store food properly after a serious spraying by a skunk. Initially devastated about his inability to signal a passing plane for help, Brian works to improve his skills by constructing a studier lean-to. These incidents mark a change in the “new” Brian, one who is far more self-reliant than the “city boy” who left on the plane to Canada. My students enjoyed the notion that “city boy” values must change to include skills they valued as well. In recounting Brian’s emotional turmoil caused by his parent’s recent divorce, Paulsen uses simple and effective word choice and syntax; Brian is monosyllabic with memories, “The words. Always the words. Divorce. The Secret. Fights. Split. The big split.” Many of my male students spoke monosyllabically as well. These simple statements capture Brian’s stream of consciousness effectively without sentimentality. 54 days after the plane accident, Brian is rescued. Like all characters in a coming-of-age novel, he is not the same; he is more introspective and thoughtful. Paulsen’s narrative convinces students that Brian’s transformation is real, and that maybe such transformations are possible for themselves. Hatchet was the 1988 Newbery Honor book and, fortunately for teachers wishing to offer books like Hatchet, it is the first in a trilogy + one. After Hatchet came The River,(1991); Brian’s Winter, (1996); and then Brian’s Return, (1999). Paulsen also has two non-fiction offerings: the book Guts, a set of true short stories of survival, and Winterdance, a story of running the Iditarod. Both titles were also popular with my students. Paulsen’s wilderness experiences set a high standard for adventure stories for my students, and the experience of reading this book was often so powerful that I had to (figuratively) drag them “out of the woods” in the book to notice other compelling stories on our classroom’s bookshelves. Hatchet was my “go to” for the reluctant reader, and I always had several copies on hand to lend out. There were copies for the first time reader and for the re-reader, but I did have to draw the line on occasion. While Hatchet can still be the best book some of my students have ever read, it cannot be their last. This blog is moving with me. 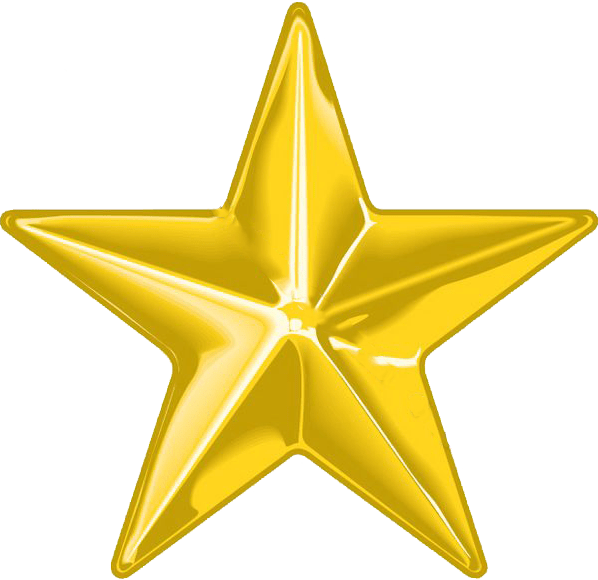 This Used Books in Class blog will now be headquartered in West Haven, Connecticut, as I have taken a position as the Language Arts, Social Studies, Library Media and Testing Coordinator for their public school system. West Haven is a shoreline community with six elementary schools, one intermediate school, one middle school, and a high school that houses a student population four times my previous school. I am very excited about this opportunity. One of my first responsibilities will be helping teachers at the middle school (grades 7 & 8) develop an independent reading program for their extended English/Language Arts period. To make the reading program a success, the teachers plan to offer student choice in reading and that means the classroom libraries need to be expanded. Six bags full for $180 ! Building or expanding a classroom library can be expensive, but by seeking out gently used books, the expense can be minimized to as little as $.50/book. One simply needs to know where to look….and the best place to look for gently used quality books for any age is at the Grandmother of all Connecticut Book Sales, the Labor Day Book Sale that benefits the Mark Twain Public Library in Redding, Connecticut. Some library book sales in Connecticut have a few tables or sections of a room devoted to books for children or teen readers. In contrast, the Mark Twain Library Book Fair has an entire room with literary treasures galore for young readers. I had hardly scanned the first tables when the neatly arranged copies of Rick Riordan books caught my eye. All three copies of the Red Pyramid filled the bottom of my bag, followed by novels from his Percy Jackson series, including the elusive The Last Olympian. I turned around to find a variety of titles from John A. Flanagan’s Ranger’s Apprentice series, selections from Anthony Horowitz’s Alex Rider series, selections from Margaret Peterson’s Haddix series as well as copies from Suzanne Collins’ The Hunger Games trilogy. 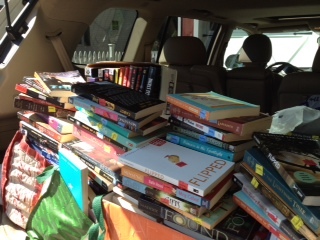 Boxes of Young Adult (YA) novels & non-fiction from the Mark Twain Library Book Sale; $.50-3.50 each! Once I collected books from YA series, I looked for individual titles by writers who are always popular: Gary Paulsen’s Hatchet and Brian’s Winter, Mike Lupica’s Heat and Travel Team; Jerry Spinelli’s Maniac Mcgee, Milkweed, Stargirl; and a plethora of princess stories from Meg Cabot. 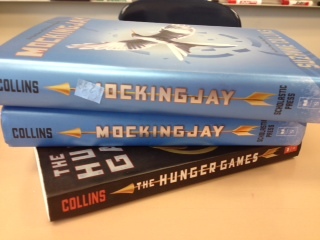 If there was a book that was a hit with middle school readers, this book sale had it…in triplicate. Finding multiple copies was helpful, since multiple classrooms will be accessing these books during the same independent reading periods. For this reason, I had no problem justifying the purchase of seven copies of Louis Sacher’s Holes or Wendelin Van Draanen’s Flipped. There were several student volunteers tabulating my haul, and I would ask them every now and then, “Did you ever read that book?” or “Do you think a student would like to read this book?” They would nod enthusiastically. Chicken Soup for the Teenage Soul got a soulful look from one of the tabulators, who explained, “Some stories in this are just so…sad. I felt better reading them.” They approved of my selections. 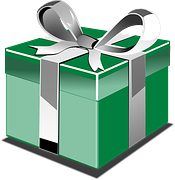 I was soon packed up with six bags full of young adult novels and non-fiction for $180, and I was helped to my car by a boy scout (literally…he was in uniform!). Now, let us see how these expanded classroom libraries help grow the students of West Haven! How challenging is it for a teacher to run an independent reading program? Very challenging. That is the only thing thing that Newsweek reporter Alexander Nazaryan got right in his NYTimes op-ed piece The Fallacy of ‘Balanced Literacy’ (7/6/14). His lack of success in having students choose their own reading for pleasure over the course of one school year, should not grant him the opportunity to decry the practice. His own failure to encourage students to engage in reading for pleasure should not dissuade other teachers from encouraging students to develop life-long reading habits. Had he the proper training and resources in balanced literacy, he would have witnessed how the challenge of implementing independent reading in a classroom can be met at any grade level and is a critical step to making students life-long readers. If he had the training, he would recognize that teachers who are familiar with books for specific age groups and levels of interest can make reading recommendations to students or help facilitate highly successful peer to peer book recommendations. If he had the resources of high interest, low-level texts in jam packed classroom libraries for his students, he would have increased the level of engagement. If he had utilized the time for reading to individually confer briefly with students about their reading while other students read quietly, he would have established a classroom routine that would allow him to informally measure student growth as they read. Finally, if he had impressed upon students the importance of reading for pleasure, he would have helped their academic success in all other classes. The amount of free reading done outside of school has consistently been found to relate to achievement in vocabulary, reading comprehension, verbal fluency, and general information. Students’ reading achievement correlates with success in school and the amount of independent reading they do (Anderson, Wilson, and Fielding 1988; Guthrie and Greaney 1991; Krashen 1993; Cunningham and Stanovich 1991; Stanovich and Cunningham 1993). This research from the ALA is borne out by testing through The National Assessment of Educational Progress (NAEP) test, which has monitored the academic performance of 9-, 13-, and 17-year-old students since the 1970s. 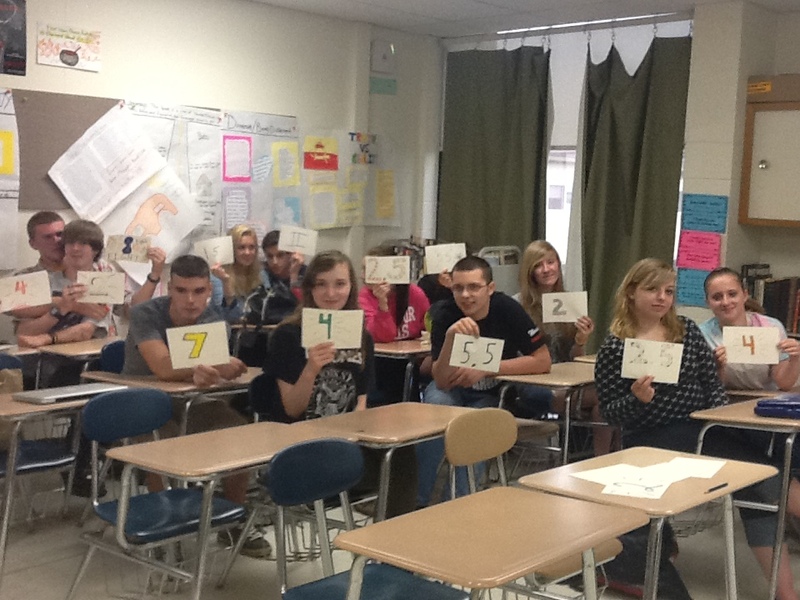 Long-term trend assessments in reading are measured on a scale of 500 points. 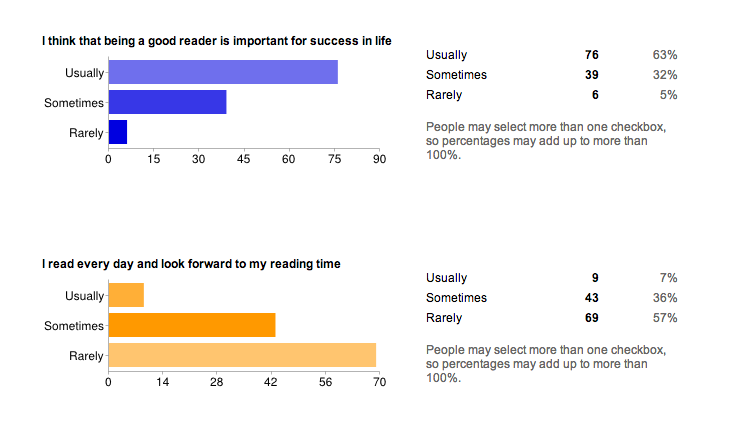 In taking the NAEP, students volunteered information on their reading habits. The results from this data in 2012 demonstrated that the average score for the 22% of those students aged 13 who never (or hardly ever) read independently was 25 points lower than students who read every day. By age 17, the difference had increased to 30 points. This data confirms what we have witnessed in our own classrooms. 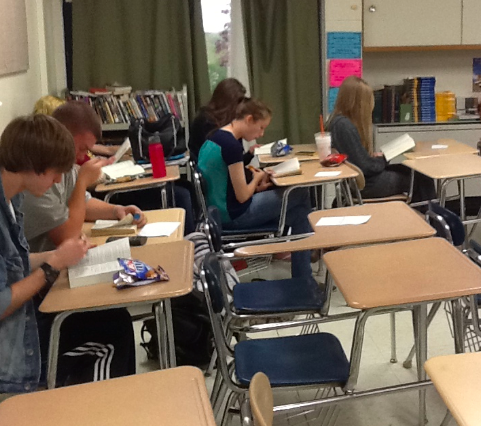 Our students are given SSR (silent sustained reading) time in class for independent reading in grades 7-12. Independent reading for our school means that students get to choose what they would like to read without having to take a quiz or a test on the book. The only “requirements” are that students keep a running record (we are using Shelfari) of their independent reading books. We ask them to share their recommendations with their peers. We talk to them about what they read. Sometimes students are offered a choice from a length list of thematically connected books, and sometimes the choice must be in a particular genre (non-fiction, memoir, world literature). Other times, the choice is entirely open and students can read whatever books they want. Our block schedule allows us the luxury of offering students 15-20 minutes each period. A quick estimate means that over the course of the school year (40 weeks), meeting twice weekly (roughly 30 minutes minimum a week), students will be offered a minimum of 20 hours of reading time in class. They make very good use of that time. The main goal of our independent reading program is to encourage students to read beyond the walls of the classroom; our 15 minutes spent in class is intended as a “hook” to connect students with books that they might want to read or as a “refresher” to reconnect a book already being read. Encouraging students to read independently means practice, and the time we provide in class contributes to that reading practice. 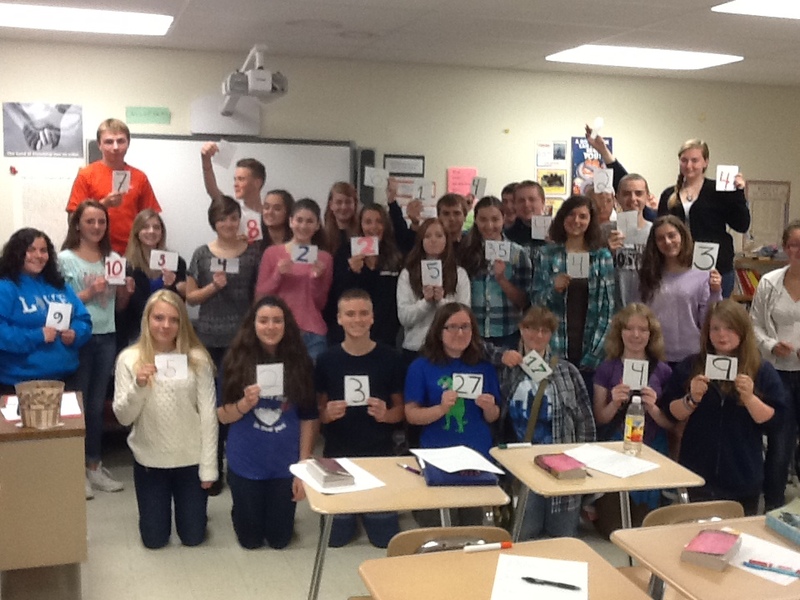 At the end of this year, we are celebrating the number of books read over the course of the year by taking group photos of students proudly holding up the number of books they have read independently over the past school year. So, rather than read a confessed failure in an op-ed piece that incorrectly characterizes independent reading written by someone who has left education, take a look at how the challenge of independent reading is being successfully met in our classrooms. The proof is in the pictures.